The abandoned amusement park at Chippewa Lake and about 95 acres of land surrounding it are being offered for sale for $3.75 million. The park operated until 1978, and some remnants of the rides remain. Read more from The Medina Gazette. Hopefully someone can salvage that old Tumblebug that is in the photos. There are only a few of those around. I doubt it. It's all rust at this point. I did think that it would be neat to do some kind of boutique retail and somehow preserve the Ferris wheel frame, put some lights on it and such. Most of all the mechanicals and train cars(minus the bodies) are in use or in storage at Conneaut lake park. When nI was there last year it was running on 3 Chippewa motors. I'm sure this information is out there somewhere, but in the meantime I wonder just how many Traver/Chambers Bug rides still operate? Could Conneaut and Kennywood have the last ones? I'm pretty sure Blackpool removed theirs. The Blackpool ride was ripped out in 2006. The location on the park has remained empty but it does have a bunch of turtles on it as a shrine, as it were. Why on earth? I realize things don't last forever, and I guess maintenance and repairs, if parts aren't available or need to be machined, might finally do a ride in. We've also lost the Monorail, Noah's Ark, Tagada, Astro Swirl, Water Chute, The Whip (adult and junior), Cableway. "Oh the humanity" etc. They had to cut some serious costs and those rides were cut in favour of keeping the five wooden coasters, I guess. Something we've talked about before, for sure - but you end up with a park that resembles a museum that enthusiasts love, but the public just think is tired. I guess it all depends on how you market it. Kennywood maintains quite a few of these older rides plus 3 wooden roller coasters. Most of these are popular with everyone, not just enthusiasts. Indeed, certainly an element of that. Also, Kennywood doesn't have the problem that it sits 50ft from the Irish sea that rusts and rots everything on the park. Was there a junior version of this ride? 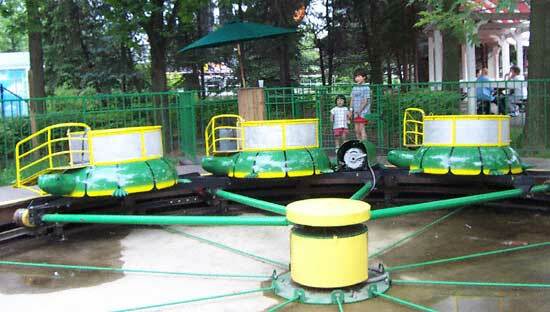 The Tumble Bug pics I found online look like a super sized Flying Turtles at SeaBreeze Park. Yes, R.E. Chambers (who acquired the assets of Traver) built a kiddie version of the Bug ride. It was standard in most parks in PA, and OH for years. There are still a number of these being used today. Kings Island had one that I believe came from Coney. It was re-themed to a character of some sort. I'll have to check to see if it's still there. Conneaut Lake also has a kiddie turtle ride still operating.